This post was contributed by a WeAreTeachers community member who wishes to remain anonymous. Indeed, childhood is when they learn these skills. Scary, right? I see similar versions of these same behaviors as a middle school teacher all the time. A scaled-down example of this is a parent who called to ask for an extension on a writing project on behalf of their child I’ll call Josh. What kind of thing? I wanted to ask. Anything less than perfectly comfortable? Of course, some parents have children who suffer from anxiety, depression, or other forms of mental illness. The parents of these students may, understandably, try to remove struggles and challenges from their child’s life because they’ve seen the way their child has responded to other struggles and challenges in the past. And while I fully acknowledge every child and situation is different—for example, 504 students absolutely need certain struggles eliminated to be on a level playing field with their peers—I’m not sure that the solution for every sensitive child is to remove as much struggle as possible. I have clinical anxiety that can feel crippling at times and that I struggled with often throughout my childhood. But I can’t imagine how much worse my anxiety would be if my parents had taught me that my anxiety was something to be feared and avoided, not dealt with head-on; had I been raised to shy away from anything outside my comfort zone instead of process and work through my discomfort; had I received the message as a child that my parents—not me—were the only ones equipped to handle the challenges in my life. Check out our video on lawnmower parenting here. 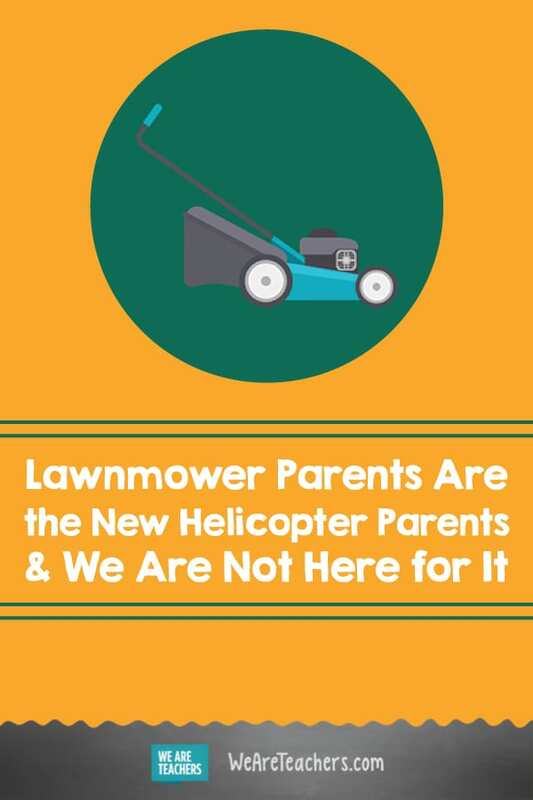 "Instead of preparing children for challenges, lawnmower parents mow obstacles down." P.S. 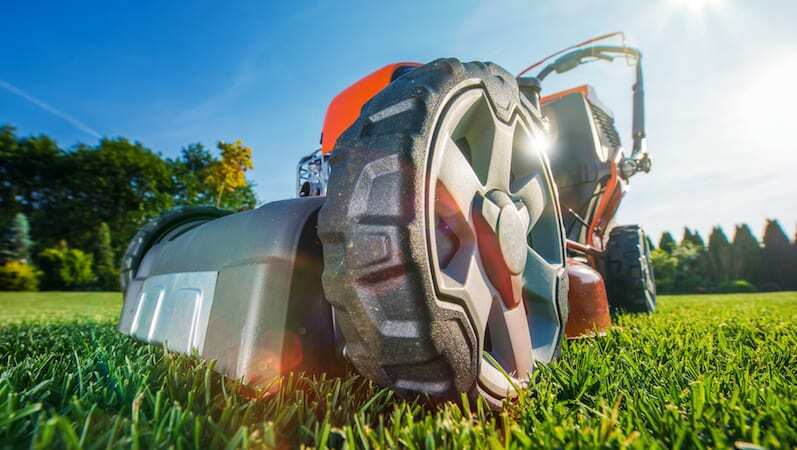 : This article by a college professor on lawnmower parents is worth checking out. Come and share your thoughts on lawnmower parents in our WeAreTeachers HELPLINE group on Facebook. Plus, teachers share the most outrageous requests from parents. I am so tired of judgmental people. Why do we have to make up names. Just because someone doesn’t raise their children the way you think they should be raised, doesn’t make it wrong or right. If given the chance, we would ALL like to have life a little easier at times so, if every now and then we can go that for our children, I don’t see the problem. Has this dad done this everyday? If so then maybe there might be a problem but to have this opinion over him showing up one time, maybe you are to difficult and need to be more empathetic. Teachers and administrators scream that parents aren’t involved enough, then we get involved, ask questions, wait, now we are to involved. Please make up our minds. Hmm. i do not find this as a judgmental article. It is more based on facts from educated people that have seen this trend affecting people/children. When you do not vaccinate your child, they will get very sick because their body isn’t prepared properly. In this article, the example is the child didn’t want to drink from a foundtain, so daddy brought her a water bottle (say nothing about the fact that the child has and is using a cellphone at school). The example to the child should have been, “If you forget it, you won’t have it.” A few times of that will trigger the childs brain to do something about it to help remember. Life is full of these type of “failures” that help teach critical thinking and abiolity to handle these failures. If you see nothing wrong with this, then as the article calls it, you may be lawnmower parent. No one is screaming, especially not from administration. There is a difference in a parent being involved as opposed to doing everything for their child–I think you missed the whole point of this article. As a teacher, one way parents can be involved is offering to chaperone at events. This doesn’t mean they are a “helicopter parent” so long as the parent is there to help on field trips and school functions when additional adults are needed–as opposed to attempting to earn brownie points from the teacher on behalf of their child (or some other form of meddling). Another way would be to assist with their child’s homework by ensuring that it takes place at a designated room at home and during specific times (e.g., at the table from this hour until, etc.) This is to stay informed of what their child is required of and maintains a much better chance of their child staying on top of it. An example of what NOT to do would be a parent contacting administrators first (e.g., breaking chain-of-command by deliberately and immediately going above the teacher’s head) to mandate a ban on homework. In order for someone to excel at something they must practice it, and homework should not be expected to be completed during class! At any rate, I definitely know what the author of this article means…far too often parents will just do their child’s project for them (without even reading the teacher’s instructions!) and will most certainly SCREAM to administration when that project receives less than a perfect grade (true story there). The mother bird teaches her baby bird how to fly…but, in order to learn what not to do, the mother bird must be willing to let her baby fall (e.g., allow some margin of error, as well as demonstrate proper technique, etc.). But instead, it’s like these “lawnmower parents” prefer to just “flap their baby bird’s wings for them” (or simply carry them everywhere) rather than expect their baby to have to “ruffle his/her feathers”. Just as common is the mother bird who has access to vast resources and just buys some sort of contraption that does all of the “wing-flapping” (remember, this is an analogy), all the while telling everyone she is proud that her baby bird is “doing it all by themselves!” when in reality there is very little knowledge retained from year-to-year from their child as they have never been expected to do anything INDEPENDENTLY. While I completely understand the concerns in the article, I’m really disappointed in the way that children with mental health needs were addressed. Using the word “suffering” is incredibly degrading and perpetuates so many things we are looking to get away from in education. Also calling someone a “504 kid” is outrageously insensitive. A 504 is a plan that is in place to help a child who is facing a challenge that requires accommodations, not an adjective. Why is it judgmental to point out techniques that a parent can use in order to help their child become more independent in order to learn how to handle the types of skills, at an early age, that they will need to master to become successful adults? Teach them to plan, organize, find alternative solutions, speak up, handle disappointment, be resilient, try another method, learn how to handle uncomfortable conversations, build consensus, find win-win solutions to problems, recognize and accept that you are not always going to get what you want every time and that doesn’t make someone else ‘the bad guy’, etc.